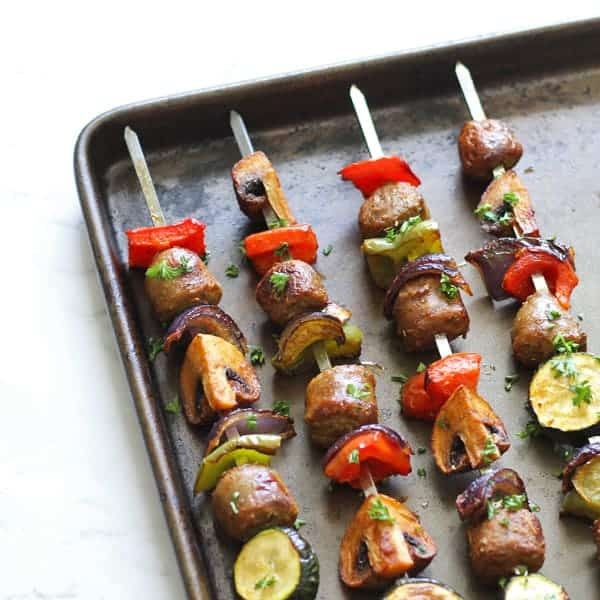 These Grilled Sausage and Veggie Skewers make for a quick, easy and healthy dinner. Thread the ingredients onto skewers, fire up the BBQ and dinner is served in 20 minutes! This post is in partnership with Perfectly Balanced. Summer is just around the corner and I can’t wait to fire up the BBQ and cook ALL THE SKEWER DINNERS! I don’t know why but putting food on skewers makes it instantly more enticing. And today I have a delicious new skewer recipe for your guys to try – these Grilled Sausage and Veggie Skewers. This recipe is in partnership with our friends at Perfectly Balanced and I’m so excited to introduce you to them. 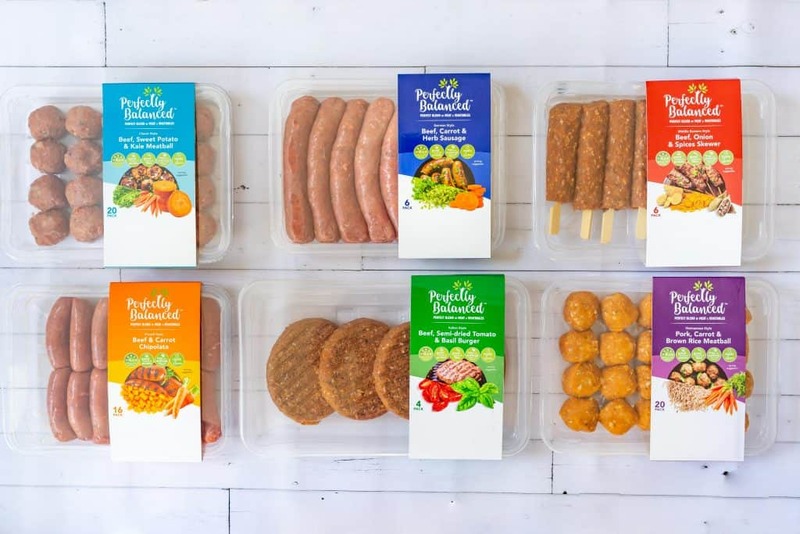 Perfectly Balanced are on a mission to help Aussie families sneak more vegetables into their daily diets by mixing them into some of our favourite meat goods, and they’ve just launched a brand new line of products. I’m talking sausages, meatballs and burgers, and that’s just scratching the surface. Today’s Sausage and Veggie Skewers are made using the Beef, Carrot and Herb Sausages from their range, and they are my absolute favourite. I have always loved sausages, but I try not to eat them too often as they aren’t the healthiest food. But luckily Perfectly Balanced have found a way to make my beloved sausages healthier. I find their sausages are much less oily then regular sausages, and they are so full of flavour. 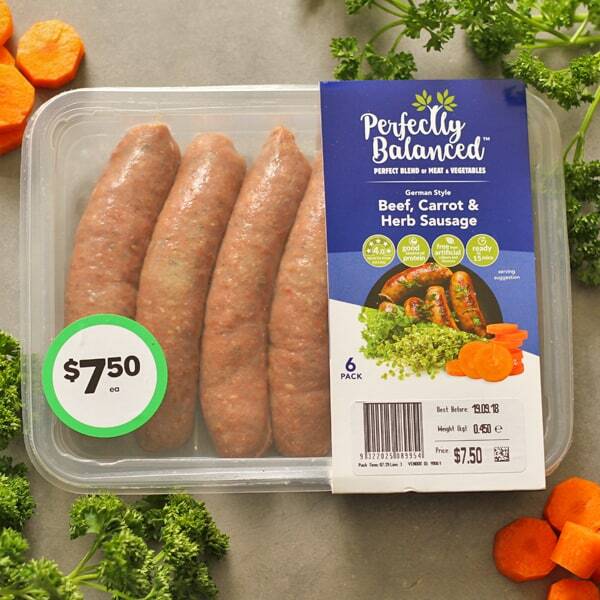 To celebrate the launch of Perfectly Balanced’s new range, I had a chat to their Chief Taste Tester Lisa Campbell to help us find out a bit more about their products. 1. What makes the Perfectly Balanced range unique? Perfectly Balanced offers Aussie meat favourites like sausages, meatballs, burgers, chipolatas and skewers with hidden veggies and herbs. Instead of having to prepare foods with hidden veggies from s cratch, the carrot grating, bean blending, and sweet potato chopping is already done for you. It helps to create stress-free healthier meals in a hurry and makes it easier than ever before, to serve the whole family with the beloved two veggie and meat combo. 2. Are your products suited for people with dietary requirements? Yes, the products are dairy and grain free, and therefore suited for customers who avoid those food groups. All products are also free from artificial flavours and colours – What you see is what you get! Our Beef and Pork is 100% Australian and sourced from farmers across the country. The vegetables, legumes and spices are sourced from selected Australian and European farmers. 4. What’s your favourite Perfectly Balanced product? If I had to choose one, I would say my favourite is the German Style Sausage. I just love the flavour, texture and ingredient profile, and they are so versatile too! Whether I use them in sausage bake, simply cooked on the BBQ with mash and greens on the side, or for a quick lunch in a bun with coleslaw. You can also perfectly use them as leftovers in your omelette the next day. 5. How can people get their hands on the range? All products are found in Woolies stores across Australia. Thanks Lisa for taking the time to tell us a bit more about Perfectly Balanced! Want to use other veggies? Go for it! Feel free to sub in any vegetables you prefer or have on hand. Can’t get your hands on the Perfectly Balanced range? Sadly this range is only available in Australia, but if you want to make these skewers at home feel free to sub in your favourite sausage. Pop the skewers onto a baking tray and cook in the oven (200C / 390F) for 20 minutes or until the ingredients are cooked through. You can easily turn this into a delicious sheet pan dinner by popping the ingredients onto a baking tray and cook in the oven (200C / 390F) for 20 minutes or until the ingredients are cooked through. Preheat grill or grill pan on medium. Place all ingredients including seasonings and oil together in a bowl and mix well. Thread onto skewers, alternating sausages and vegetables. Place skewers onto the grill, turning occasionally, until the vegetables and the sausage is cooked through, approximately 10-15 minutes. Transfer skewers to a platter or plate and serve. I use metal skewers. If you are going to use wooden skewers, be sure to soak them in water 30 minutes before using. Feel free to use your favourite sausages in this recipe if you can't get your hands on the Perfectly Balanced range. Don't have a grill or too cold to fire it up? Pop the skewers on a baking tray and pop into the oven (200C / 390F) for 20 minutes, or until cooked through. Don't have skewers? Throw the ingredients onto a baking tray and pop into the oven (200C / 390F) for 20 minutes, or until cooked through. Mixture makes approximately 8 skewers, depending on how large your skewers are. Nutrition information is a rough estimate. If this is important to you, I'd recommend recalculating yourself with the ingredients you have on hand. This recipe is sponsored by Perfectly Balanced, who make my most favourite healthier sausages. Thank you for supporting the brands who help make this site possible. Great kebab alternative. I’ll try making this soon! Excellent tIPS Thank you so much for your helpful shearing post! I’m sure you’ll love this one Georgia!